Carrots can act as a vasodilator with the increased amounts of potassium. Vasodilators decrease vascular resistance, increasing blood flow and circulation. The carrot or Daucus carota subsp. sativusis a root vegetable, usually orange in color, though it can be purple, red, white, and yellow as well. The carrot is native to Europe and southwestern Asia and is used in many regional cuisines. 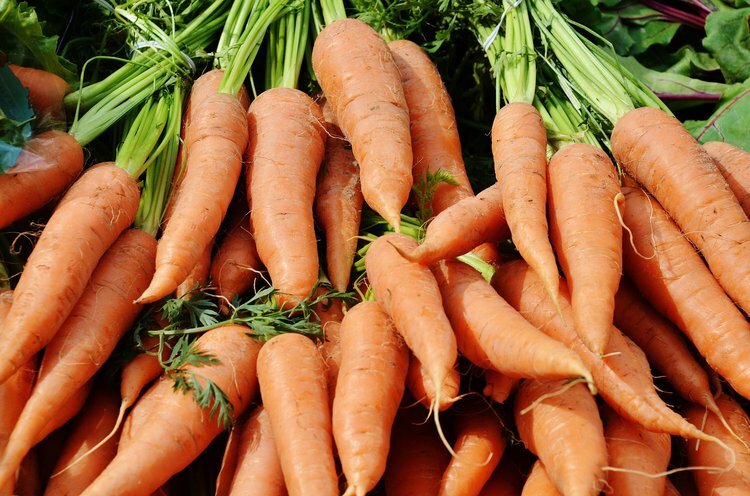 Approximately, 35.6 million tons of carrots are produced annually. When fresh, the carrot has a crisp texture. This popular vegetable contains main health benefits as well. Here are the 7 health benefits of the carrot. 1. Carrots help improve the blood pressure. Carrots can act as a vasodilator with the increased amounts of potassium. Vasodilators decrease vascular resistance, increasing blood flow and circulation. This reduces the risk of atherosclerosis, strokes, and heart attacks. The coumarin found in carrots has been found to reduce high blood pressure. 2. Carrots can improve one’s digestion. Like most vegetables, carrots are an excellent source of fiber. One cup of chopped carrots (28 grams) contains 4 grams of fiber. Fiber aids can help prevent constipation and stimulate the contractions of the smooth muscles that forces food through your system. The daily recommended fiber intake for men and women are 38 grams and 25 grams, respectively. 3. Carrots can help decrease the risk of cancer. The beta-carotene found in carrots have been associated with reduced risk of several cancers. A medium sized carrot contains approximately three milligrams of beta-carotene. Researchers have suggested that increasing beta-carotene consumption from 1.7 to 2.7 milligrams per day reduced lung cancer risk by more than 40 percent. 4. Carrots can help keep your eyes healthy. Carrots are rich in vitamin A with 428 percent of the recommended need per serving. Vitamin A is known for improving one’s eyesight and preventing night blindness from developing as we age. 5. Carrots can help individuals with diabetes. Carrots can contribute to improving blood sugar regulation because of carotenoids. Carotenoids help decrease insulin resistance and contribute to reducing blood sugar levels in a stable manner. 6. Carrots can help prevent heart disease. A study from the Wolfson Gastrointestinal Laboratory in Edinburgh, Scotland concluded that cholesterol levels drop by an average of 11 percent when seven ounces of raw carrots per day are taken for three weeks. 7. Carrots can help boost your immune system. Carrots are a good source of vitamin C, which can stimulate the activity of white blood cells to fight infection. Also, carrots contain a number of antiseptic and antibacterial abilities. Gilani, A. H., Shaheen, F., Saeed, S. A., Bibi, S., Sadiq, M., & Faizi, S. (2000). Hypotensive action of coumarin glycosides from Daucus carota. Phytomedicine, 7(5), 423-426. Kidmose, U., Hansen, S. L., Christensen, L. P., Edelenbos, M., Larsen, E., & Nørbæk, R. (2004). Effects of genotype, root size, storage, and processing on bioactive compounds in organically grown carrots (Daucus carota L.). Journal of Food Science, 69(9). Surles, R. L., Weng, N., Simon, P. W., & Tanumihardjo, S. A. (2004). Carotenoid profiles and consumer sensory evaluation of specialty carrots (Daucus carota, L.) of various colors. Journal of agricultural and food chemistry, 52(11), 3417-3421.